Check whether the stroke is within specification when the parking brake pedal is depressed with 66 lb (30 kg, 294 N) of force. Also, the parking brake alone should securely hold the vehicle on a fairly steep grade. 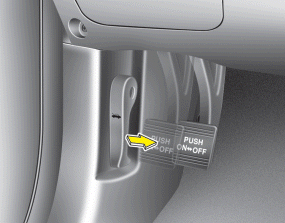 If the stroke is more or less than specified, have the parking brake adjusted by an authorized HYUNDAI dealer.